The Labyrinth: What Happens Next? | Words of Wisdom? The Labyrinth: What Happens Next? 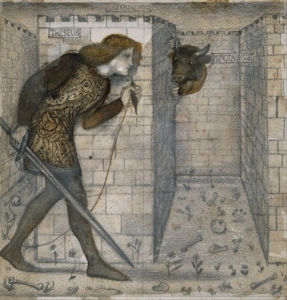 The ancient myth of the Minotaur and Theseus in the Labyrinth has, apparently, several – if not many – versions. The stories vary from each other in both minor (was it annually or every nine years that sacrificial youths were sent into the Labyrinth? Was it thread or a trail of jewels with which Ariadne helped Theseus escape?) and major ways. The ending is certainly a point of contention: Did Theseus abandon Ariadne on the Isle of Naxos on his way back to Athens, or simply forget her? Was she so distraught by his leaving her that she hanged herself, or did she die naturally prior to giving birth to their child? Or did the god Dionysus see her sleeping on the beach, fall in love with her, and marry her?). What happened next after the slaying of the Minotaur in the Labyrinth is in question. The ending is ambiguous and open to interpretation, as in life. While we may each walk the twisting path of the labyrinth, intending to slay our personal demons, or realize our dreams, or reach our ultimate goal, there are choices we make along the way which make the journey unique to each individual. The pace at which we travel, the gravity of our step, the thoughts we entertain and those we reject, the attitude we adopt… personal choices which serve to create a unique experience for each of us of the journey through the Labyrinth that is Life. Our ending, too, is in question. Although we know that we all must reach the end at some point, how will the manner in which we travel affect the quality of the journey? How will we choose to view our experience of it? What kind of conclusion will we accept? On your own journey along life’s winding, often uncertain path, what happens next? This entry was posted in The Labyrinth and tagged choices, perspective, UU 4th Principle. Bookmark the permalink.